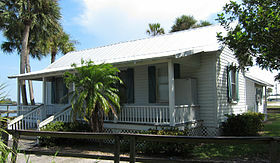 Florida cracker architecture is a style of vernacular architecture typified by a wood-frame house. It was widespread in the 19th century and is still popular with some developers as a source of design themes.
" Florida cracker" refers to colonial-era English pioneer settlers and their descendants. There was no air conditioning, and the new immigrants to the Sunshine State had to depend on nature to get some relief from the heat. Houses of this style are characterized by metal roofs, raised floors, and straight central hallways from the front to the back of the home (sometimes called "dog trot" or "shotgun" hallways, similar to the shotgun house design). They built their homes surrounded by wide verandas or porches, often wrapping around the entire home, to provide shade for their windows and walls. Some houses had a clerestory that would improve the ventilation in the interior. ^ Clarke, Bob (April 25, 2014). "Cracker House". A History of Central Florida Podcast. Retrieved January 23, 2016. Wikimedia Commons has media related to Florida cracker architecture. Valle, Erick (2005). "Florida Vernacular Architecture". Feature articles. Traditional Neighborhood Design. Archived from the original on 2006-05-19. Retrieved 2006-06-28. "Gallery: Florida Cracker Homestead". Exploring Florida: A Social Studies Resource for Students and Teachers. Florida Center for Instructional Technology, College of Education, University of South Florida. 2002. Retrieved 2006-06-28.